The Sisters’ Rice Festival is sometimes called Sisters’ Meal Festival or Eat Sisters’ Rice Festival. The legend is there was once an old man and his wife who had three beautiful daughters. One day while they played on the riverside, the young girls felt lovesick. Zhang Guolao, a bearded God who carried a bamboo tubular drum, possessed the spirits of the girls, telling them to prepare five-colored rolls of glutinous rice filled with shrimp, fish and other special things. When young men came down from the mountain, the beautiful girls presented the rice to them. In this way, the young girls found their marriage partners. 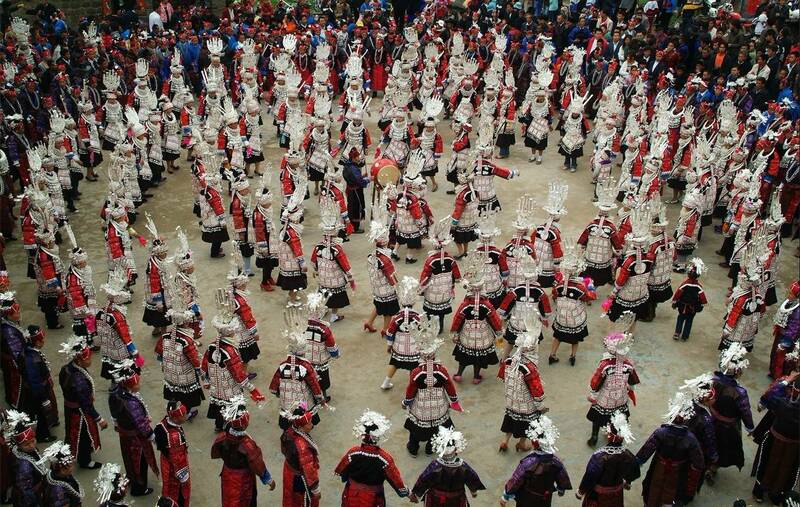 The Miao minority “Sisters’ Rice Festival” is a celebration of spring and of love. Dressed in finest embroidered and appliqued clothing, adorned in all their freshly shined silver jewelry, young women set out to attract a suitable mate. That’s the traditional goal, but fun is the name of the game! Two, sometimes three, festival days are filled with dancing, singing, eating, drinking lots of rice wine, watching bull fights and cockfights, and horse racing. 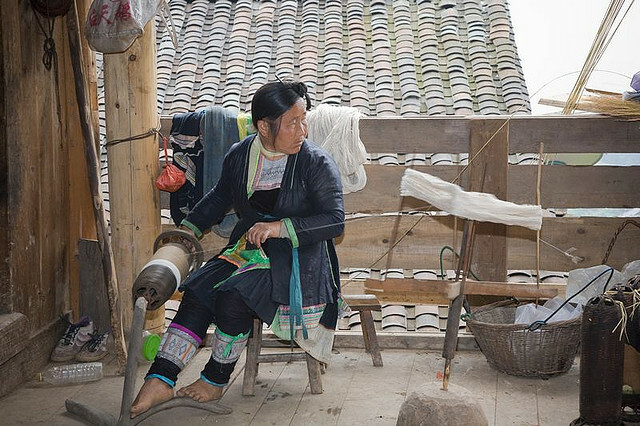 It is said that the Miao originated from the egg of a butterfly that emerged from a maple tree. The butterfly married a bubble and laid twelve eggs. A mythical bird called the Jiyu watched over the eggs for twelve years and finally they hatched into a Miao man known as Jiangyang, a Thunder God known as Leigong, a water buffalo, snake, dragon, tiger, centipede, elephant and four other omens. All of these symbols are found in the exquisite embroidery and colorful decoration of these artistically talented people. Also in anticipation of the Sisters’ Rice Festival, the grandmothers, mothers and other female relatives polish and shine the collection of silver neck rings, bracelets, anklets, earrings, hair pins and combs, rings and pendants, phoenix crowns and headpieces that the young courting-age girls will wear. The Miao believe that silver, representing light, dispels evil spirits. Silver is also a symbol of wealth and beauty, and some young women wear several kilograms of it at one time Dazzling embroidered skirts, blouses, aprons and jackets are decorated with many different tooled silver ornaments. Pretty necks are encircled with bands of silver and linking silver chains that support large shining lockets, glittering beads and hanging tassels. Elaborate silver headpieces crown the heads of the girls as they proudly display their self-made costumes. 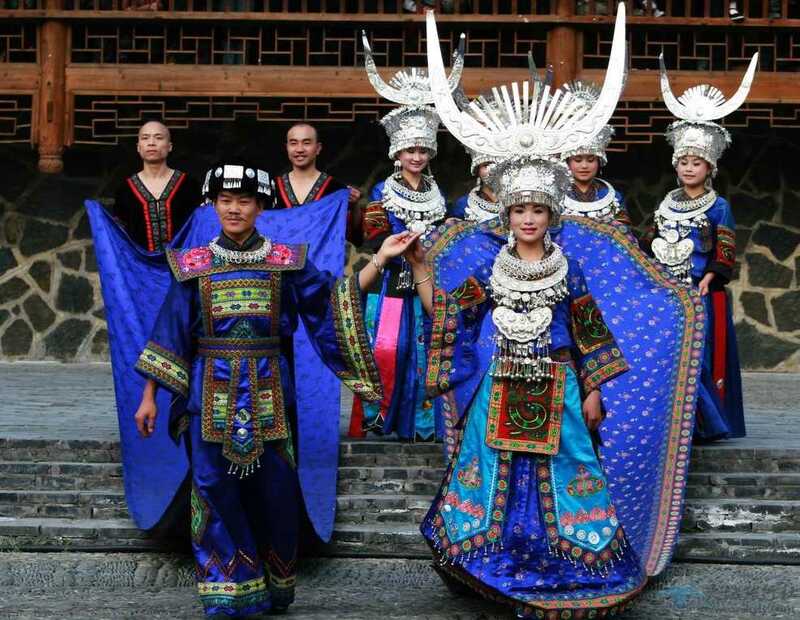 The Qingshui riverside becomes lively and exciting as the music and dancing begins. As they walk and dance, the lovely Miao girls jingle and shimmer in the sun. Their cheeks burn with excitement while they flirt with handsome young men, each of whom is searching for a beauty worthy of his strength and handsomeness. 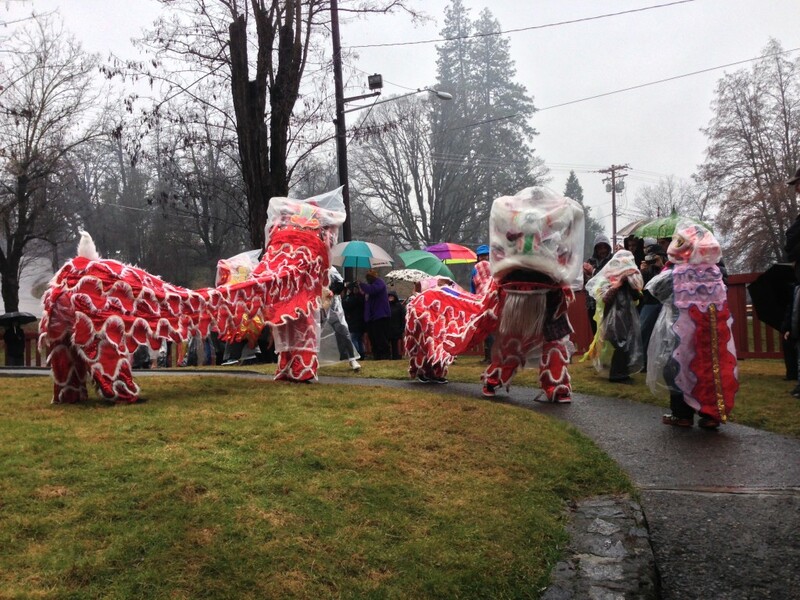 When darkness falls, the festival beat increases as the Dragon dances begin. Candles are lit inside the 25-meter-long hollow paper dragons. Battles begin as the fiery dragons weave in and out of the hooting crowds chasing each other. Drums and fireworks complete the noisy atmosphere. Long into the night, the partying continues… Bamboo flutes and wooden drums echo sounds throughout the valley as the dawn breaks, beginning the next day’s festivities. As crowds slowly gather, the lovely dancing girls strut like peacocks while the boys look on admiringly. Mid-morning approaches, and the elders rush off to the bullfights. Excitement rises as the mighty bulls lock horns, trying to wrestle each other to the ground. All day long, one bull after another is defeated and then the final match begins. The winning bull brings great honor and riches to his owner for the following year, so although it is festival, the participants enter into the fights with a certain seriousness. Such anxiety calls for much merriment, eating, drinking and friendly betting. The champion bull’s horns are festooned with chickens, ducks, red ribbons and flowers as he is led around the battleground and through the town, snorting proudly for all to see. Finally he is bathed in the soothing waters of the Qingshui. The crowds thin out as people join picnics and special feasts. Into the evening, the elders continue to make the rounds, greeting their friends, swapping stories and songs, sharing tobacco and wine. As the moon rises high in the night sky, young lovers wander off. The mountain paths are busy with the sounds of tinkling footsteps and clear melodious voices singing gentle love songs to the tunes of Lusheng pipes.